Today marked a momentous occasion in the JC household. JJ finally lost his first tooth. He’s nearly seven and a half and is the last of his classmates to have reached this milestone. It’s been loose for some time and this morning it was at a right angle to where it was supposed to be and I knew it wouldn’t take long. He was eating popcorn at school today and out it came then. It’s now home so maybe the tooth fairy might visit here, although JJ said he doesn’t believe in the tooth fairy. He’d like some cash though. Dilemma! 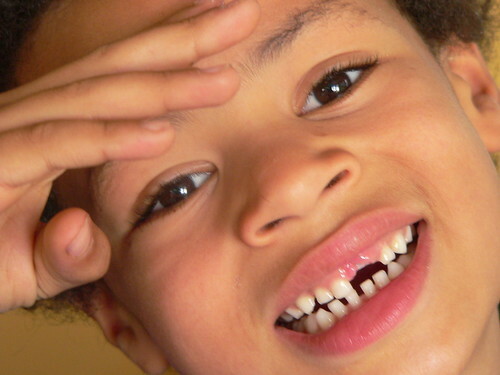 Has the tooth fairy visited your household? It never did mine as a kid. Oh unfortunately you are on the horns of a dilemna. I heard today on the news they have recently discovered that magic is more important than money to a child’s happiness. My daughter knew – at least I thought so and was playing along. Then she was a bit gutted when she really found out. The tooth fairy visited us last night. JJ informed me that he found $1 under his pillow. I asked him where it was and he said he was holding it. No, in fact. I guess my mom and dad just not into the ‘tooth fairy’ thingy, they do let me keep the tooth though, but not under the pillow. Sigh..
Ching Ya, my parents weren’t into the tooth fairy thing either. I always lived in hope but tooth fairy never came. He is so cute! My nephew is 7 and a half and he still doesn’t have a wobble in his teeth! My kids were all towards the last in their classes to lose their first teeth. It is a very exciting time. Thanks for trying to let me know about my blog issues – I have had way too many problems with my host, but have paid for 12 months so will try and hold out a little longer.